Reading and share top 7 famous quotes and sayings about Deryn by famous authors and people. 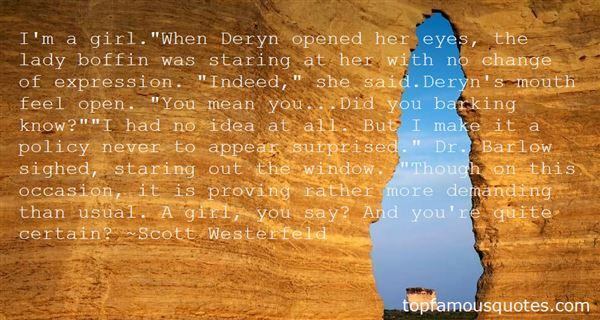 Browse top 7 famous quotes and sayings about Deryn by most favorite authors. 1. "Alek was right behind her now, his body pressing close as he adjusted her sword arm. She hadn't realized this fencing business would be so touchy. He grasped her waist, sending a crackle across her skin.If Alek moved his hands any higher, he might notice what was hidden beneath her careful tailoring. "Always keep sideways to your opponent," he said, gently turning her. "That way, your chest presents the smallest possible target. 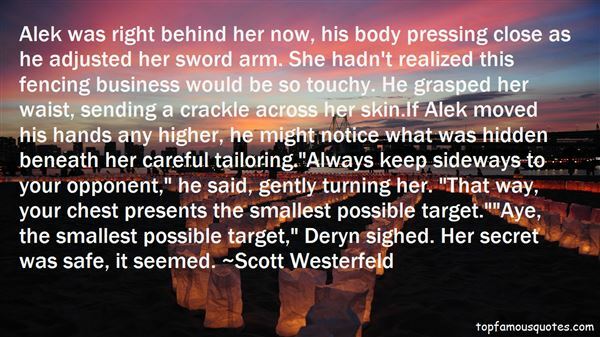 ""Aye, the smallest possible target," Deryn sighed. Her secret was safe, it seemed." 2. "I'm a girl. "When Deryn opened her eyes, the lady boffin was staring at her with no change of expression. "Indeed," she said.Deryn's mouth feel open. "You mean you...Did you barking know? ""I had no idea at all. But I make it a policy never to appear surprised." Dr. Barlow sighed, staring out the window. "Though on this occasion, it is proving rather more demanding than usual. A girl, you say? And you're quite certain?" 3. "I kissed him once," she whispered. "Well done. What did he do?""Um..." Deryn sighed. "He woke up." 4. "Do you love him? "Deryn swallowed, then pointed at the screen. "He makes me feel like that. Like flying." 5. "Dr. Barlow, it is, of course, customary to check with the caption before, uh, giving away his ship." -Deryn Sharp"
6. "Deryn felt brilliant, rising through the air at the center off everyone's attention, like an acrobat aloft on a swing. 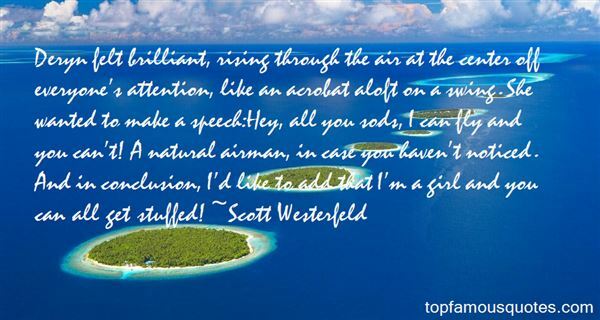 She wanted to make a speech:Hey, all you sods, I can fly and you can't! A natural airman, in case you haven't noticed. And in conclusion, I'd like to add that I'm a girl and you can all get stuffed!" 7. "As one does a bear riding a bicycle. One sees it so rarely. (Spoken by Volger, on Deryn)"
No blind folds, I want to see you. No masks, I want you to see me. There is no deception in truth."